The expression on the face of this Honeycomb Cowfish makes it look like it was caught by surprise. Its mouth is puckered and its eyes are wide. But this is the way this fish looks all the time. Why do you suppose this fish looks like this? 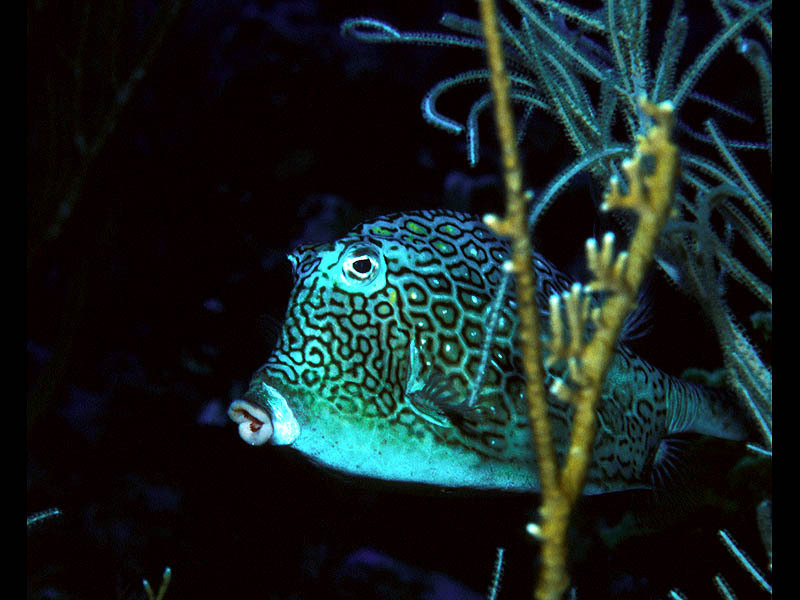 The Honeycomb Cowfish is found near coral reefs throughout the Caribbean. As an adult fish, the Honeycomb Cowfish may be between 10 and 18 inches long. That was about the size of this fish, which was maybe 15 inches long. It is easy to see where this fish gets its Honeycomb name. The Honeycomb Cowfish is covered by a pattern of hexagonal (that is, six-sided) spots that resemble the pattern of a bee's honeycomb. The rest of its name, Cowfish, comes from the two bony horns above its eyes. These horns give its eyes some protection. In this picture, it is easiest to see the ridge above the fish's eye that is nearer to the left side of the picture. The ridge sticks out from the fish's forehead and is easy to see against the dark background. The Honeycomb Cowfish has a puckered mouth for a very good reason. This fish hunts by blowing a jet of water out its mouth into the sand. This stream of water will scare out any animals hiding in the sand, such as crabs or worms. Then the Honeycomb Cowfish can swim down and slurp them up. There are two kinds of corals in this picture. The orange coral with the white tips on its branches is a Fire Coral. The long, curling gray branches belong to a colony of Sea Whip Corals. 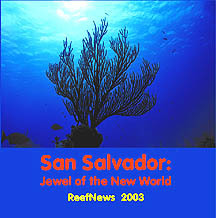 Copyright © 2001, 2004, ReefNews, Inc.